Elysium is the closest the 98% and immigrants will ever get to “just deserts.” It is “better up there” and evil too, says the world writer/director Neill Blomkamp has created. Elysium fits into the gritty, grounded, and highly entertaining sci-fi mold that we expect from the director of the Oscar nominated District 9. It’s a bit disappointing, then, that Blomkamp isn’t able to meet such high expectations. The script doesn’t match the originality of the world he has realized and Blomkamp resorts to yelling allegory at the audience, but hey, at least he actually has something to say. The trailer told us everything we need to know about the promising premise: Earth has become overpopulated, forcing the rich to build their own Elysian fields filled with perfect lawns, magical cancer curing beds, and Caucasian lunch parties. Max (Matt Damon) is an ex-con trying to do right with the lifelong desire to escape the extreme poverty of earth for the orbital suburbia of Elysium. That desire transforms into necessity at the end of the first act and the plot unfolds accordingly. Blomkamp has written a tight film that follows all the rules of screenplay writing (there are still plot holes, but it’s all in name of thematic concerns). Character’s desires are blindingly intense, there is a clear unity of opposites, the dialogue reinforces the film’s thesis while expositing character, the film is exactly 120 minutes. Although well-paced and crafted, this script-by-numbers undermines the impressive creativity of the world Blomkamp produces. The beats are pretty predictable for such an ambitious film. You’ll know instantly what characters are expendable and what character the film will turn to next. All the essentials are here, but they fail to delight in the way the film’s set design and premise do. Elysium is an obvious commentary on immigration policy and economic class tensions akin to the 98% debacle. The film’s premise can be distilled to one real world question: If a nation or minority group has enough resources to help others, then why not allow those who are less fortunate access to this wealth? This conflation of the 98% and immigration issues creates the most brilliant stroke of commentary Blomkamph has to offer: The 98% are part of the 2% on a global scale. The film also shows the American complacency in some of the real evils that occur at the Mexico border in the name of xenophobia. Sadly, the premise lets us down. The allegory at work here is too heavy-handed to facilitate an enlightening discussion of the problems at hand. They are evil and greedy and we are justified and right. Blomkamp never really goes further than this manichean morality. Some may point to a particular moment of redemption, but it’s forced. If an advertisement explicitly tells you to buy something, you’ll never do it. If an advertisement convinces you that you came to that decision on your own, then you may buy that product. Similarly, Blomkamp’s allegorical hand hits us too hard and in doing so we are never completely sold other than sentimental cheering for the underdog. The issues are explored without hinting at anything more than greed as the problem. And maybe for the film’s world it’s that simple, but its class conflict suggests something symptomatic of the society’s dominant economics. This is only a two hour feature, one heavily invested in allegory, so subsequently Blompkamp takes the “white whale” approach, using primarily one character as the symbol for why Elysium is immoral. There is some nuance in the metaphors, like Blompkamp’s use of language. The poor of L.A. speak Spanish while the citizens of Elysium speak French, the language of the bourgeoisie. Subtle nods like these could have made Elysium’s allegory much more engaging and less didactic. Next to realizing a believable world, directing action is one of Blomkamp’s strengths. The action scenes in the film are entertaining, inventive, and brutal. There are about two instances where Blomkamp uses a tight and fast moving over-the-shoulder cam reminiscent of a third person shooter, creating an effect that is impressively immersive. Fortunately, Max isn’t a practiced war veteran and the fights unfold with appropriate tension. The sci-fi weaponry is novel and exciting, yet still grounded in our reality. This makes the engagements fun to watch just to see what type of arsenal will be implemented. That being said, Elysium can be extremely violent, as is fitting for the harsh world of this earth. However, these literally explosive moments (there are only a handful) eventually become darkly comedic in their indulgence. It’s worth mentioning the Matt Damon and Sharlto Copley, who you might recognize as Wikus (the protagonist from District 9), do a great job reinforcing the realism the film is so concerned with. So does most of the cast. Matt Damon’s performance fosters compassion for Max and Copley utter disgust for ostensible Minutemen, agent Kruger. Although I was a bit tough on Blomkamp, I do appreciate that he has something meaningful to convey through his film. It may not be successfully executed, but well-meant themes are there and we can at least think a little more than we’re used to in these blockbuster films. This mixture of thoughtful pulp action should be encouraged. Blomkamp is undoubtedly a talented director/screenwriter with much to say. It’s just disappointing that a film so interested in ethical and philosophical quandaries never treads water at the deep end of the pool. 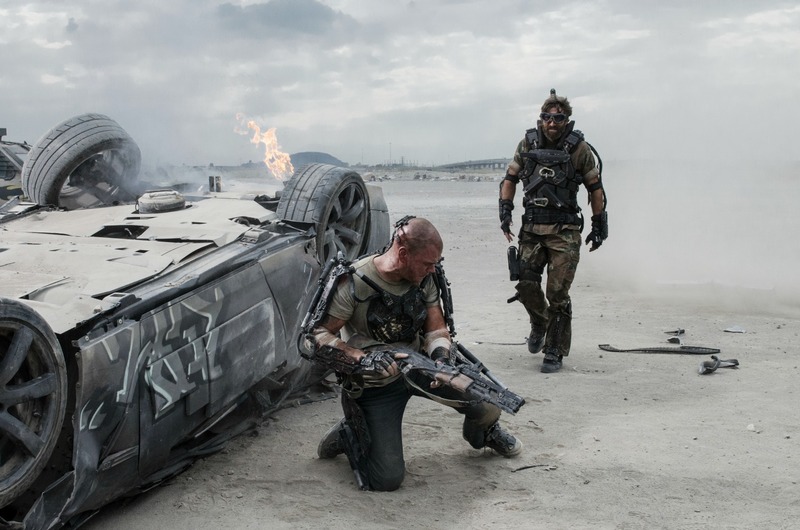 Elysium is by no means a bad film, just one that failed to reach its orbital destination. Amen. As a friend put it though, it seems like this might be Blomkamp’s money making movie (MORE EXPLOSIONS, MORE CYBORG FIGHTS) so that he can go back to making less financially successful but more thought provoking films like D9. At least that’s what I’m hoping his plan is. I think all the money did aid in his trying too hard. But Elysium is still more thought provoking than almost any movie in theatres right now. Jodie Foster’s “unnecessarily evil syndrome” was too distracting for me to take anything it said seriously. Hahaha, so true. Her turn was the worst.